central hub of downtown Indianapolis. Hungry for drum corps? If you're in downtown Indianapolis this Wednesday, June 23, take a break from the grind and bring your lunch to a free concert with the Glassmen. Starting at 11 a.m., the corps will take the steps of Monument Circle in the heart of downtown Indy, wowing curious onlookers with ensemble and individual performances and a "meet and greet" session with corps members. "We're really looking forward to introducing the Indy community to one of the many corps that will be making their way to Indianapolis this August for the World Championships," said Drum Corps International's Diane Peasel. "This performance should definitely get people excited to check things out at Lucas Oil Stadium a month and a half from now!" Here's a more detailed breakdown of the lunch event: the Glassmen will set up starting at 10:30 a.m. and warm up from 11 to 12:15. The warm-up includes individual section exercises from the brass, percussion and color guard sections, so you'll see firsthand what corps members do to get ready for rehearsals and performances. At 12:15, the corps will fill Monument Circle with the sounds of its standstill performance, followed by the opportunity to interact with the Glassmen members. 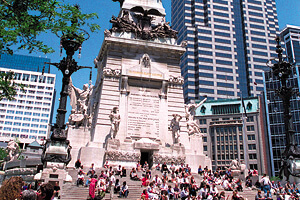 Get directions to Monument Circle in Google Maps.